A lot of us know that Nat Ford's time with Muni is up as Washington D.C. is looking into hiring him. A lot of us don't like the agency (Muni) with the service cuts, an uncontrollable union, safety concerns, late or no-show buses, and that incident when the union told Cable Car operators to boycott (not participate) in the most recent bell ringing contest. It's time to get Nat Ford out of office and get someone more competent to take-over the agency. The material below is just for laughs, nothing serious, unless if you want it to be. We the citizens of San Francisco highly recommends you hire Nathaniel Ford immediately for the lead position for your airport authority. At the SFMTA, he runs an excellent operation, including the famous Muni service. He has been able to keep the budget intact, maintain reliable service, happy employees, and still offer passengers low fares to ride around the city. Also, he has been able to maintain an excellent safety record for the transit agency. There have been no major incidents for the longest time. I believe he would be a great candidate to hire as soon as possible as other agencies in the nation wants to hire him as well. We the citizens of San Francisco highly recommends you hire Nathaniel Ford immediately for the lead position for your airport authority so he can get out of our hands. 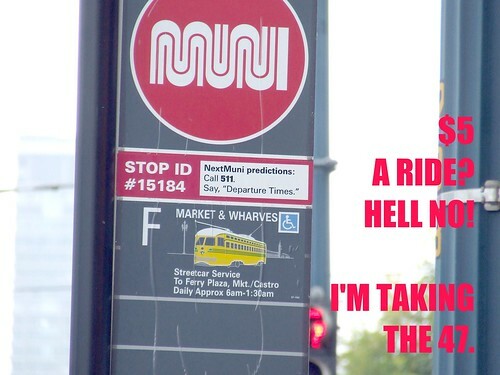 At the SFMTA, he runs an horrifying operation, including the infamous Muni service. He has been able to keep the budget in the red for years, maintain unreliable service with no-shows and metro derailments, greedy employees with a union so powerful that he can't control them, and raises the prices of passes. Also, he has been able to maintain a concerning safety record for the transit agency. There have been major incidents regarding the light rail (metro) system, including major derailments, an operator passing-out and slamming into another rail car, poor track maintenance in the Twin Peaks tunnel resulting in much slower trains, and rumors the Twin Peaks and Sunset Tunnels have not been seismically tested. I believe he would be a great candidate to hire as soon as possible because us San Franciscans are fed-up with him and wants him out of office. We don't want to fire him because we don't want to pay-off his contract, so by making him voluntarily quit SFMTA and get another job is a better deal. Dulles is completely disconnected from Washington, DC... your choices are a $50+ cab ride or a $10, 30 minute bus ride followed by a another 30 minutes on the Metro. Nat Ford will be perfect for the job there... the taxi drivers will love him, because he'll make sure the Metro extension out to the airport gets delayed ANOTHER 10 years. Maybe he'll shut down the new moving walkways and bring back the "moon buggies" to transfer between terminals, too!